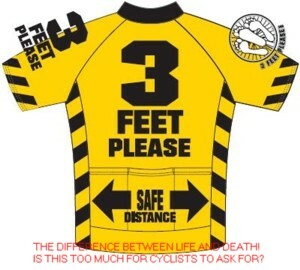 The Cycling Dude: Share the Road, and Trail: Safety Matters! George, George, George on Your Bicycle, Look Out for That...Ohhh!... Door! BU Bikes, the Cycling Advocacy Blog at Boston University, has a photo of the aftermath of a Dooring, and a link to an excellent Back to School Bike Guide, by Boston Biker. Read: Watch out for those doors! Clearly the Motorist, in this case was wrong, but Bike Lanes to the left of where cars ARE allowed to park are not my favorite places to ride. I despise painted Bike Lanes to the left of where parked cars are allowed because the open car door enters completely in the path of a cyclist in that lane. In Long Beach, Ca., where i commute, everyday, everyone is oh so proud of 2 stretches of Bike Lanes on 2nd Street, and one on 1st, that I travel on with extreme caution. The 1st part of the 2nd St. route is painted green, through a business district where cars park along the curb. The 2nd 2nd St. section, and the 1st St. section, go thru a residential area where the parked cars are parked diagonally, and the drivers have to back-up to leave their space, and thus enter the bike lane. On those 2 sections the cyclist also has to deal with the occasional cyclist riding the wrong way, ignoring the arrows, and the fact that the streets are one-way streets for all users! 1. A program dubbed "complete streets" that aims to focus on cyclists and pedestrians rather than only motorists is being considered in Des Moines, and has not been fully embraced by the public. 2. Leaders of something called the Metro Advisory Council are exploring approval of a regional ordinance that could include elements of certain protections for cyclists that failed to pass in the Iowa Legislature earlier this year. It was a bill that would have expanded required passing and following distances..
3. A group called Citizens for Safety Coalition of Iowa wants to prohibit bicycles on farm-to-market roads, which include paved county roads and some of the more heavily traveled gravel roads. Paradise. Nirvana. Whatever you call it, we're lucky mugs to have a tranquil respite from the urban madness and permanent bottlenecks. But wait. Do I see a collision in the making? None of this catapults the issue to the top of our list of regional concerns. But how hard is it, really, to enforce regulations and prevent accidents? Southern California does a lousy job of accommodating bikes on city streets. You'd think we could at least get it right at the beach, but hazards abound. Read the whole piece: On Santa Monica's beachfront bike path, an uneasy mix. Senate Bill 148, which would require motorists to keep 3 feet of space between vehicles and bicyclists - is not only an accident waiting to happen, as one opposing legislator has pointed out, but a slew of lawsuits as well. Just try driving Florida Road any nice weekend, and you'll encounter everything from polite defensive bikers strung out in their lane single file, to mobs of dozens huddled together blocking entire lanes and refusing to "line out" even when cars are stacked up behind them with horns tooting. His solutions, to what he sees as a problem, involves wider bike lanes, making cyclists pay a road tax, setting a maximum legal size for groups of bicyclists traveling together, and "decreeing some county roads simply too narrow, winding, high-speed and dangerous to allow for bicycle traffic at all." While the wider lanes idea seems a good one, the other ideas are totally unworkable. The cost alone, in enforcing those notions, would be a problem for state governments, and citizens, especially in these hard economic times. Setting group size, when there's no guarantee the whole group is even together at any given point on the ride? Does that mean toll booths are every major intersection? A tax would especially be unfair to the poor...especially those who don't own cars, and rely on their bike as part, or all, of their transportation options. Telling cyclists they can't travel on certain roads because they are dangerous? When part of the problem causing the dangers on such roads can be laid at the feet of the motorists cyclists share the road with?